When people ask me what I do for a living, it still feels funny to say “I’m a blogger.” In this day and age, people often feel defined by their career, so to say something that sounds so random and misunderstood (to most people) can be awkward. The follow up questions are typically: What does that mean exactly? What do you blog about? How many followers do you have? What do you do all day? I think the most mysterious question is the latter, and I myself was baffled by how bloggers filled their days, until I started doing it full time myself. I thought it would be a lot of lunch meetings and manicures, followed by dinners and parties. That’s probably the case for some gals, but so far from my reality! 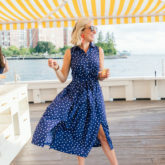 There are definitely days or nights where I’ll get to attend a fun event in the city or go to a party with other bloggers, but since I live so far away, I rarely go to them anymore. I thought that the easiest way to do this would be to share what a typical day looks like for me. I hope this gives you some insight into the bizarre world of bloggers! Feel free to ask questions if I missed anything. Every day can vary pretty drastically, but this is what my normal days look like. 7:00am I wake up and say three things that I’m grateful for. It’s always the first thing that I do in the morning, and such an important part of having a good day for me. Then I check social media from bed. It’s an awful habit that I am trying desperately to break, but might never do. After a few (or many) minutes of that, I let the dog out and start my 20 minutes of oil pulling. I’m going on week three right now and still loving it. During that 20 minutes, I always try to get my bed made, wash, tone, and moisturize my face, change out of PJs (into yoga pants TBH), feed the dog, and put on hot water for tea. 7:30am Drink tea and make breakfast. I always wake up hungry so breakfast is one of the first activities of my day, everyday. My go-tos are gluten free toast with ghee, peanut butter and chia seeds, a green smoothie, or scrambled eggs with avocado and hot sauce. If I don’t eat protein in the morning, I end up being hungry all day long. 7:45am I always eat my breakfast at my desk in front of the computer. Another awful habit, but I like to get moving as soon as possible in the morning since it’s when I’m most productive. One of the best parts about working for myself is being able to choose my hours. Starting before 9am might seem awful for some people, but I’d rather start early and take an hour or two off in the middle of the day. 8:30am After answering emails, responding to reader comments and DMs, catching up on my favorite blogs, and scheduling social media for the day, Boots and I go for our morning walk. Some days we do a full hour of hiking in the woods, and other days we meet a friend for a walk around the block. Either way, he gets antsy if I don’t exercise him by 10:00am so I like to get it out of the way. One day a week, we have a dog walker who takes him to the woods with his doggy buddies. On that day, I workout with Madison during this time. 9:30am Back to business. This is the chunk of time where I get the most work done. For the next 2.5-3 hours I write the next day’s blog post, plan for and set up photo shoots if I have one that day, and look at my editorial calendar to plan ahead. If I have a collage going up that week, I’ll spend at least an hour creating that (they can take forever). It’s also a time where I email back and forth with my manager about any upcoming campaigns, and work on those. I manage a lot of my husband’s business with him… Everything from accounting to marketing to events. So I often spend an hour or so during this time working on stuff for Countdown. 12:00pm For lunch, I try to eat leftovers from the night before or make a big salad, but sometimes I’m lazy and go for carrots and hummus with an apple and almond butter for dessert. I’m only human! During lunch, I try to step away from my computer, but that doesn’t always happen. When I do, I’ll either eat in front of the TV, watching an episode of whatever is recorded on my DVR, and when it’s nice I’ll grab my book and eat outside to soak up some sun. Sometimes I’ll have lunch with a friend, and will take a little more time off so that I can get there and back without having to rush. 1:00pm This is when I typically schedule calls, meetings, photo shoots, sand appointments. Calls can be anything from talking to my designer about updates we’re making to the site, to catching up with my accountant about this quarter’s taxes, to chatting with a brand about a potential partnership, to connecting with other bloggers about best practices on Instagram. Appointments refer to personal tasks like doctor’s appointment, hair cuts, teeth cleanings, manicures, or even runs to the grocery store. 4:00pm I come back to my desk to answer more emails, finalize upcoming posts, edit photos, work on the week’s newsletter, answer messages on social, and schedule social media for the next day (if I’m on top of my game). 6:00pm Normally, I like to stop working at 6pm so I can have some time to relax, workout, do some yoga, or just enjoy some calming alone time before Anel gets home. 7:00pm Start cooking dinner. I cook on most week nights, and try to make dishes that take no more than 30-40 minutes. 7:30pm Dinner with Anel. We have a strict no phone policy, and catch up on our days. 8:00pm When it’s nice out, we have a “family walk” at night with the dog. It’s nice to walk off dinner and have even more time together without phones or TV. 8:30pm We usually watching a show (currently loving Handmaid’s Tale) together to start winding down. 9:30pm At this point I get up to shower and get ready for bed while Anel watches sports and answers emails for work. I try to get in at least 20 minutes of reading (on a book, not a Kindle bc I’m old school like that) before bed. Getting out of my head and into a story with no screen time dramatically helps my sleep. 10:30pm Lights out! He wakes up at 6:00am and I need a lot of sleep, so we try to be in bed with the lights off by 10:30 every night. It’s not always realistic, but most of the time we hit our goal. I have a schedule obsession, so I loved reading over yours. I’d of course love to get to this point too where I can work from home. LOVING Handmaid’s Tale. Super creepy but very well done. I love getting schedule insight from other bloggers! Great for inspiration on how to balance it all and stay afloat! Thank you for sharing! I love this! As a newbie blogger, I can only work on it during my daughter’s naptime- I often fantasize about how nice it would be to have more time to work on it! I love that you guys do no phones during dinner- such a good idea. Yes please do! Just reading this now for the first time and was wondering where Amalia was at first… I quickly caught on when there was no sign of her by breakfast. Structure is SO hard, but so important. I use Photoshop for my collages but had to take a class on it to learn. It’s not that intuitive! I feel you! I’ve been there too. I commend you, it’s not easy lady! I was wondering if you would share the perfume you recieved in a mailing a month or so back? It was all natural and you put it on your instagram stories (sky something?). I have DM’ed you several times, so I figured I’d ask here! Thanks! I remember that too- I believe it was called Skylar! The one that I love is called Isle. I just started the Handmaid’s Tale last night. I’m not sure I can handle it. It’s so good, but it’s also so disturbing and uncomfortable. Is it worth sticking with it? It is disturbing the whole way through and actually gets worse, just a heads up. I think the story is super interesting though, so worth it in my opinion! I recently quit my day job and delved into blogging full time. On weekends I’d always have breakfast at the computer trying to get as much done Saturdays and Sundays as possible and breakfast coincided with email and social media. It’s carried over to the weekday now that I don’t have a 9-5 to go to. But it’s one bad habit I’m ok with. OMG I was the same way when working full time. I’m trying to work less on weekends now but it’s so hard! omg, I am the same way with checking my social media in the morning! My alarm goes off at 5:30 (I teach high school), and I check my darn FB and Insta for literally 10 minutes. I always tell myself that I could sleep in later and not be rushed if I could just stop that habit! lol! Your schedule doesn’t seem all that different from a usual workday for people in the office! My last internships even allowed dogs to accompany their owners in the office which was pretty fun. To be honest, I would find such difficulty focusing when I know that I could potentially slack off and no one would slap me on the wrist besides myself (and possibly the readers). Thanks for giving us insight into what your day looks like! I loved reading! It’s not that different! I just love that I can leave to workout in the middle of the day or get into the doctor during work hours. It’s made a big difference for me! Love this post, Julia! 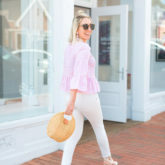 Even though I’m no where close to being a full-time blogger, it was so fun to see what full-time bloggers do during the day through this post! Thanks for this brilliant post Julia. I am just starting out in the blogging world and it is nice to know that its not to different in my current job. I love that you still find time for yourself (and hubby of course). I love these day in the life posts! Please do more of these!! what a great post! It’s nice to get an insight into your life. Great post! I love how you keep your day moving along with breaks worked in. I started blogging a year ago and haven’t yet fallen into a set routine but also have design consulting work to do. Blogging is much more work than people imagine, you have to love it to stick with it! Yes! People think it’s just taking photos and posting them but so far from the truth!! Loved this post – such an insight into a blogger’s life. I was confused by what manager means in your post. That is something I associate with an office job – dint know bloggers have managers as well. looking forward to reading what that means. Loved this post thanks for sharing, it’s nice to get an insight into what other bloggers’ typical day looks like. I am yet to be a full time blogger but I imagine my typical day will look similar to yours in some ways. Thank you! I’d love to hear about your schedule through your first year of motherhood and blogging with tips on how you manage it!